The Norwex antibacterial microfibre EnviroCloth™ removes dust, dirt and grease from all washable surfaces using only water—no chemicals! Norwex Microfibre has the ability to remove up to 99% of bacteria from a surface when following the proper care and use instructions. Our super-absorbent EnviroCloth™ picks up dust particles and traps them in the cloth until you rinse it out. 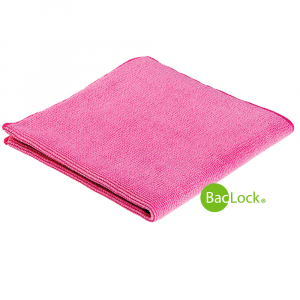 Then BacLock®* in the cloth goes to work to self-purify and inhibit odours from bacteria, mould and mildew growth within the cloth. Available in 300010 graphite, 300011 pink, 300012 green and 300014 blue and now available in 2 colours with 70% recycled materials 300040 rose quartz and 300041 champagne. Getting all the surfaces in your home as clean as possible, as quickly as possible, can be challenging. In addition, many of today’s popular cleaners contain harsh chemicals that can make your family sick, and using paper towels to clean adds to the problem of overloaded landfills and deforestation. At 1/200th the size of a human hair, Norwex Microfibre is one of the most innovative products in the cleaning industry today. Open spaces in the fibres created by the splitting process enable the cloth to lift away dust and dirt and absorb several times its own weight in water.